UNISAT FLEET — Universal Satellite Communications, Inc. Designed as a four path live transmission truck with production. Live programs or tape feeds can occur simultaneously and independent of each other. TES 1 can also be equipped with 1-4 camera systems. Making it ideal for live standup positions and satellite interviews. Equipped with Tandberg 5788 High Definition Satellite Encoders and Companion RX 1290 HD receivers. Employing a programmable 32X32 central routing switcher, multiple feeds can be selected and routed to video recorders, (four) satellite paths, onboard 6.5 GHz microwave system, fiber network or other live trucks. The vehicle's spacious layout affords accommodations for seven seating positions, two edit stations and producer's workstation. A refrigerator, microwave oven and coffee pot round off TES 1's extensive list of standard features. 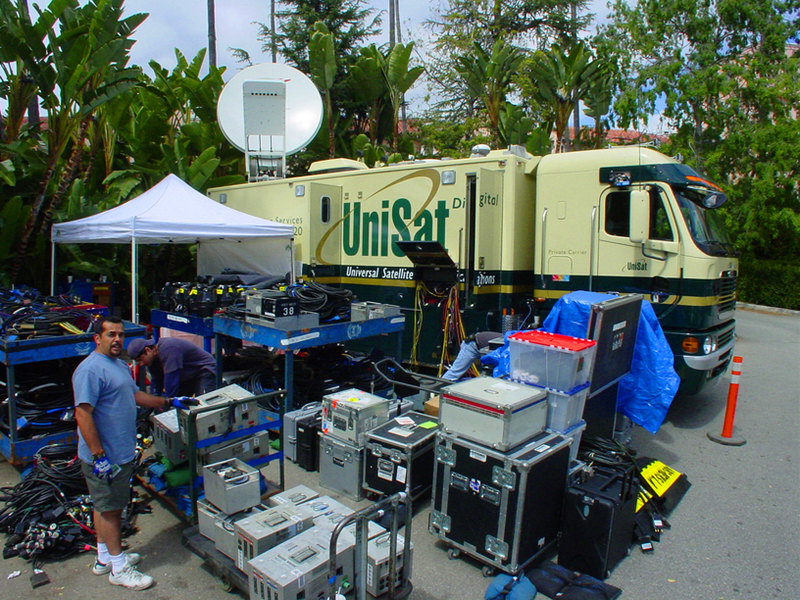 High quality video processing equipment and distribution equipment is also employed to ensure the highest quality uplinks, regardless of feed. Top quality frame synchronizers (10,12 bit) realize the highest quality pictures when remote cameras or feeds require it. Special attention has also been paid to telephone communications. 4 cellular phones, all equipped with modem jacks, and 3 satellite telephones insure reliable communications no matter how remote the location may be. 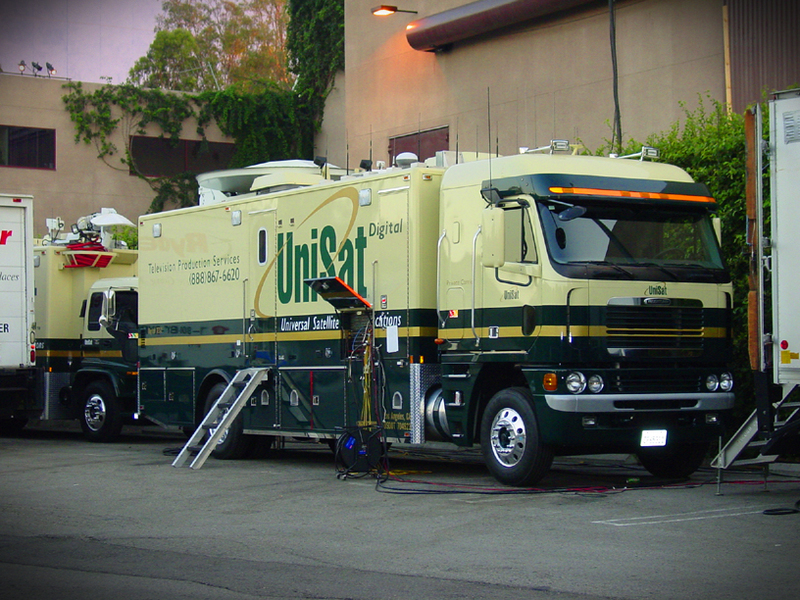 UniSat TES 2 is specially designed for multi-camera live production. Equipped with Tandberg 5788 High Definition Satellite Encoders and Companion RX 1290 HD receivers. With full serial digital (601) production capabilities, this unit is equipped with 5 of Grass Valley LDK 8000 elite HD triax camera systems. Over 62 monitors provide ample viewing of all available sources. A 24 channel RTS digital intercom system with 6 master stations, wireless IFB and 8 Telco hybrids completes UniSat’s unprecedented communications capabilities. This high performance High Definition production unit is well suited for live events, including television news specials, sports coverage, satellite media tours, entertainment specials, comedy tours, superior quality web casts & international rights holder broadcasts. 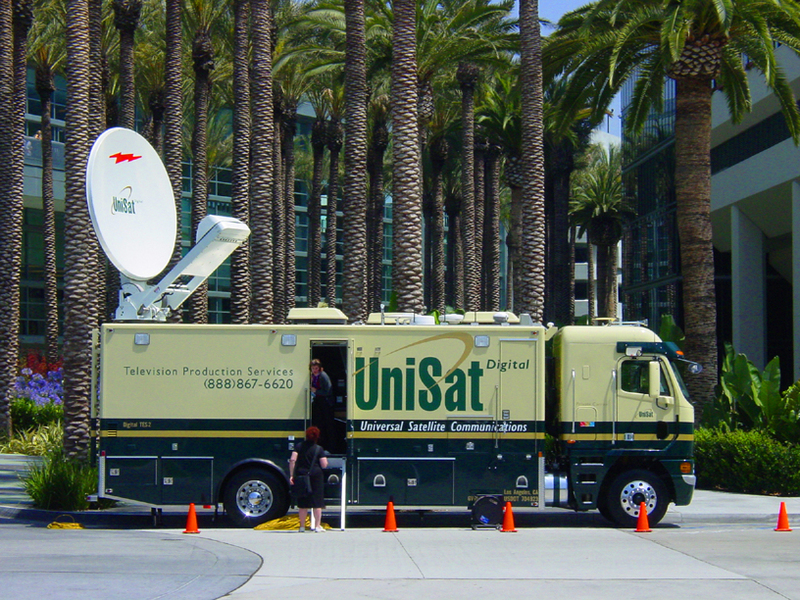 UniSat has established itself as the leader in live satellite production and transmission. Providing exceptional service at competitive rates.